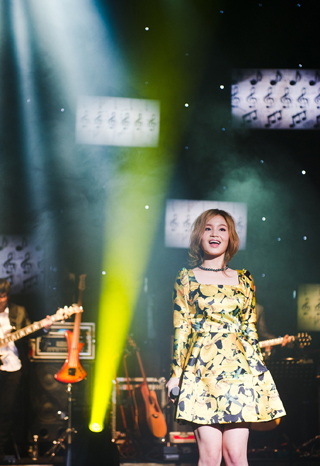 Talented rookie singer Lee Hi successfully kicked off her first mini concert. The singer, who rose to stardom from her participation in SBS’ singing-audition program ‘K-Pop Star,’ held her first ever concert ‘RE-HI’ in front of 500 fans at Seoul Seokang University’s Merry Hall. ‘RE-HI’ also served as a way for the rookie to connect with her ever-growing fan base as well as showcase her unique jazzy voice while gaining valuable experience as a performer. Lee Hi performed her hit songs such as “It’s Over”, “Rose”, “1,2,3,4” and more. She not only sung her own song, but also presented other artists’ songs including Yim Jae Bum’s “For You,” and Duffy’s “Mercy,” which she had sung before when she was completing in the audition program.